Housemarque is a games studio synonymous with the twin-stick shoot-em-up genre of video games. Starting with the 1993 release of Stardust for the Amiga/ST and DOS, while the developer has dabbled in other genres, they have generally stayed inside what’s worked for them. Their latest game, Matterfall, however, strays outside of that a bit by being a mashup between platformer and twin-stick shooting that will likely push the bounds of multi-tasking gaming, and challenge many a gamer with what it has to offer. We were able to get our hands on the game while at E3 2017, and have a preview ready for you right here, right now. The first thing I noticed while playing Matterfall is that its control scheme was unlike most any other platformer out there. The game is a sidescroller, but you use the shoulder buttons for a lot of your moves. R1 jumps/double-jumps, L1 phase shifts you through special blue walls, and temporarily freezes enemies caught in your wake, R2 fires grenades for area damage, and L2 enables a special kind of beam from your gun that can materialize platforms at certain locations, where matter falls into place. Get it? While you’re busy doing all this hopping and platforming, you’ll also be tasked with taking out enemies that look like they belong in a twin-stick shooter. Well, Matterfall also serves as that type of game – the right stick allows you to shoot your main weapon, while you’re platforming. This takes some getting used to, and your first instinct may be to stop and take aim. But most enemies are fast-moving and fire back at you, so you’ll need to learn to do more than one thing at a time if you hope to survive. All of these controls come together in boss sequences. I played through the first level plus the first boss. This boss was some sort of mechanoid spider-looking thing, which on its own wasn’t all that tough. It mostly fired energy bullets at me, hopping to either side of the stage. But it was able to summon wave after wave of enemies that I had seen in the previous level. Before long, I was phase shifting through bullets in order to use L2 on a bomb, then running over to the edge of the boss platform to wait for two rows of bullets to line up just so, phase shifting through those, shooting a few enemies, then using a super move to power up my main weapon and unleash hell on the boss. After several rounds of this kind of high-octane action, the boss was finally defeated, and the demo concluded. This is an intense game. There are a lot of flashing effects going on, and what feels like dozens of things to watch and react to on-screen. But when you’re in the thick of the action, things don’t seem so crazy. I felt myself enter that zen-like brain mode that can occur during longer stretches of twitch gaming, where each move was coordinated in response to whatever moved in my view. I didn’t play perfectly, but thankfully the game does occasionally drop health to keep the fight going. While the audio took a backseat to the action, if you know Housemarque, then you know what to expect – lots of thumping, bass-heavy arcade tracks to help you zone out to, mixed with the futuristic sound effects of the environments in which you find yourself. The world of Matterfall is a futuristic, perhaps post-apocalyptic one, with lots of bright, neon colors. I didn’t get much in the way of technical information on the game, but the game was likely running at 60 frames per second, easily. 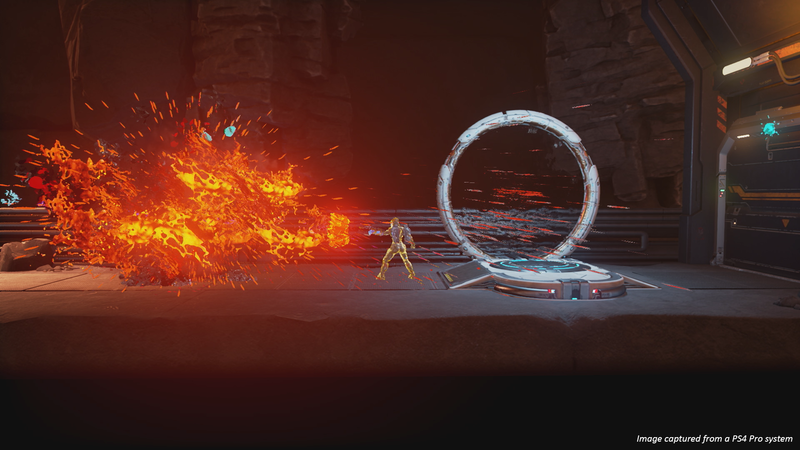 Matterfall feels like one of those games that will take a while to master, but one that will also be rewarding to those who invest the time to grasp the controls. Due to those controls, this might not end up being the most accessible title from Housemarque – however, the just-released Nex Machina will probably serve those looking for a more traditional twin-stick experience. Matterfall is currently racing towards an August 2017 release date.